To meet the demands of today's evolving RV Technology. Dometic introduces a lightweight yet powerful toilet that surpasses both RV builder and owner expectations. The Dometic 310 toilet is the best of all worlds. A value priced toilet, the Dometic 310 features revolutionary Powerflush Technology and a china bowl. Manufacturers love it for the industry- best quick, two bolt installation. Dealers love offering a china toilet at a price previously seen only for cheaper, flimsier plastic models. You'll love everything about the 310. *Full size, light weight, simplified design-perfect for today's RV. *Powerful bowl-clearing flush every time. *Conserves water-uses as little as 1 pint per flush. 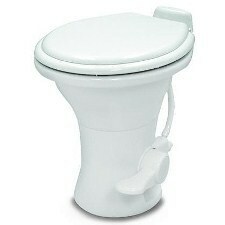 *Full size residential-style ceramic bowl and seat height for user comfort. *Ergonomic-height foot pedal for easy operation. *Easy installation-just fasten to floor flange and connect water line. 15" W X 19" D X 20" H.